Ideal family dinner. One-pot cooking. Preheat the oven to 220°C, gas mark 7. 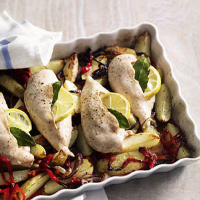 Place the peppers, new potatoes and onion together in a roasting tin, sprinkle with the olive oil and seasoning. Toss together, then bake for 20 minutes. Reduce the oven temperature to 200°C, gas mark 6. Use a jar of grilled peppers as an alternative to the fresh for this dish. Italy produces excellent whites with crisp lemony freshness and herbal aromatics to complement these flavours. Try: Monteforte Passo Avanti Soave, Veneto, Italy.